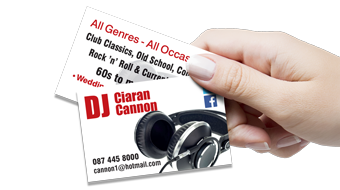 Business Cards are an essential item of business printing and a very powerful business tool. It is what your customer will look at first to contact you and so it needs to be well designed and well printed. Cavern Design Printing will happily design and produce these for you – we make thousands of business cards every week. We can make your business card stand out from the crowd. If you are starting out in business, we will work with you to design what you need to create the right impact. If you are looking to refresh your business cards, we will take your existing card and create an eye-catching design that will leave a lasting impression. As part of our quality standard in business printing we print on quality 350gsm porcelain card and also offer options of gloss or matt laminating. 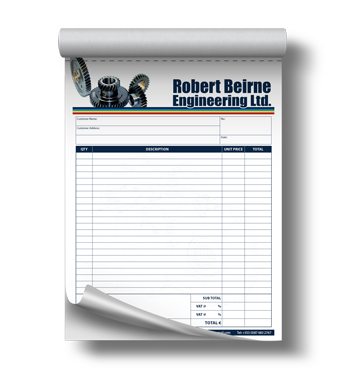 Duplicate and triplicate books are the lifeblood of a business – from Order Forms to Delivery Notes to Invoices and Statements and not forgetting the Receipt Book. Cavern Design Business Printing can produce these and many more for you, designed to exactly meet your needs. All our duplicate and triplicate books are printed on self-duplicating carbonless paper and each docket is numbered as you require. You can have only the top sheet perforated or all sheets can be perforated. We print hundreds of duplicate books every week – so much so that we often buy the carbonless paper by the pallet – and we will be happy to produce your books whether you need 2 or 200.